Berbiguières ist ein kleines, malerisches Dorf im Herzen des Périgord Noir. Seine Häuser Cluster entlang der Wände eines Schlosses aus dem 15. Jahrhundert. Das ganze Dorf ist klassifiziert und von der Kommerzialisierung geschützt. Es ist ideal für die Erkundung der Region Dordogne. Berbiguières ist leicht zu erreichen von einer reichen Auswahl an historischen Stätten, von den prähistorischen Höhlen von Lascaux, auf fast 50 restaurierte Schlösser, die von der 100-jährigen Krieg (1325-1453) mit ihren schönen stammen, bis hin zu eleganten 17. und Schlösser aus dem 18. Jahrhundert formalen Gärten. Der Zugriff auf das Dordogne zum Schwimmen und Kanufahren in der Nähe. Es gibt Bootstouren auf dem Fluss, wenn Sie eine kommentierte Ansatz bevorzugen. Die Berge locken mit hervorragenden Wandermöglichkeiten. Die Dordogne ist bekannt für seine Trüffel, ihre Foie Gras, und seine feine Küche und Bordeaux-Weine. Die Weinberge von St. Emillion, Montbazillac und Cahors sind innerhalb einer Stunde oder zwei Auto ist. Außenmärkte rotieren täglich durch lokale Städte wie Sarlat, St. Cyprien und Bergerac, wenn Sie für lokale Spezialitäten einkaufen und essen in möchten. Oder speisen Sie in einem der vielen guten Restaurants in der Umgebung. Besuchen befestigten Bastiden wie Domme, Belves, und Montpazier, für ein Gefühl der Geschichte des Mittelalters. Im Sommer gibt es ausgezeichnete Theater- und Musikfestivals zu genießen. Englisch sprechenden Nachbarn sind bereit zu helfen, Ihren Weg rund um die Hütte, der Nachbarschaft oder der Region zu finden. Dies macht das Haus ideal für Urlaub und Vermietung. WENN MEIN Wohnungsnutzung, WENN SIE MÖCHTE MIETEN, KANN ICH KÖNNEN MIT ANDEREN IN DORF ASSIST; BITTE KONTAKTIERE MICH.
We had a great time in this beautiful little cottage. It's a bit of a drive but worth it! It's close to many castles and outdoor activities. There were 4 of us and the place for us perfectly. I would recommend it to anyone. I discovered Berbiguieres by chance and loved it so much I had to go back. I found the listing and contacted Katherine to make the reservation almost 2 years ahead of time. It was my dream place and I was not let down. The place was a perfect Perigordian cottage. Perfect in every way, the welcome, the ambiance, the convenience, the comfortableness, and the simple beauty of rural France, which to me is infinitely better than the large cities. I would never go to Paris or Province when I can go to Perigord. I am an artist, an Art History and a History buff. This place has everything. The cottage is really special. I recommend it to everyone! And I felt I made a new friend with Katherine who went out of her way to make sure our welcome was impeccable. There was a wonderful terrace and garden, the view over fields and mountains is beautiful, and the amenities like kitchen and bathroom were clean and fully equipped. What a fantastic experience we had. The cottage in Berbiguières was just what we needed to get the full experience of the Perigord Noir/Dordogne Region of France. It's centrally located just south of the river and an easy drive to so many charming communities and chateaus throughout the region. 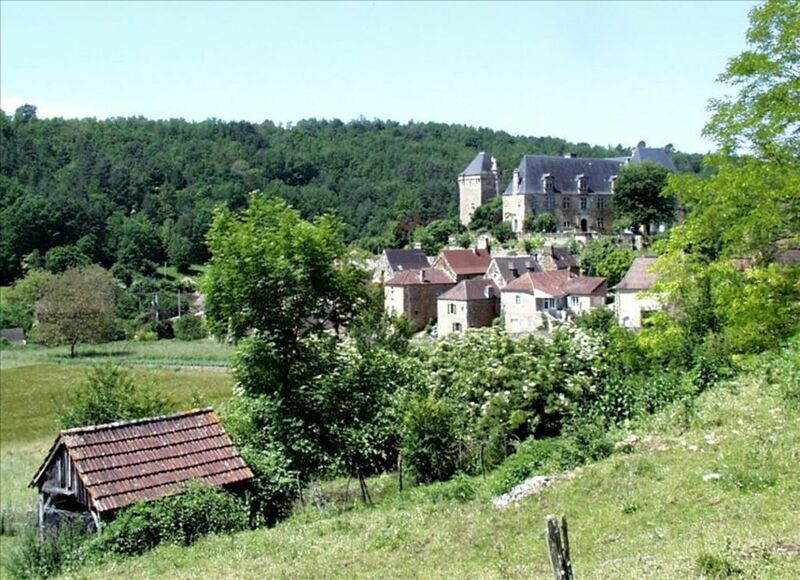 Not to mention that Berbiguières itself is a quaint, country community that is full of charm and relaxation. Our entire experience was top notch - from making the reservation with the owner to working with the local property manager. The cottage is well appointed and has everything you need for enjoying your time at the cottage and resting between outings exploring the region. You're greeted by a quaint covered patio just through the gate, situated along the walking path from the center of the village. You open the door and pass through a thick stone wall that transports you to the past with all the creature comforts of the present. A comfortable living room/dining room/kitchen offers the perfect space to plan your daily excursions or to consume your purchases from one of the local public markets. There are two bedrooms - one upstairs and one on the lower level (three stories) that offered us plenty of privacy as we were two couples traveling together. The bathroom included a wonderful shower that worked well for someone taller like me - not to mention great water pressure. All in all, I cannot begin to say enough words of compliments or thanks for such a great experience and stay. The cottage helped make our trip to the Dordogne special, memorable and down right perfect! Thanks for making it available to us - as our travels allow, we'd love to go back. Merci beaucoup!! First, what a Nice surprise when we discovered the village : so quiet, beautifull and however, full o Life ! Then, we discovered the cottage, built With the beautifull local stone. Each of the members of the familly found its place and appreciate the decoration. I particularly appreciated the spacious shower ( not so Common in France). In general, this place is comfy and easy to live. Outside There's also a Little Bench carved into a wall, massively appreciated by the kids. The garden enables BBQs and during watering the plants you can make rainbows ! I highly recommend this place for a good stay and would say it is the ideal place to Discover the aera, Lascaux, sarlat la cenada and all kinds of famous other places. Our family (2 adults and 2 kids, aged 13 and 15) enjoyed our recent stay in this cottage in Berbiguieres. We felt very privileged to have the opportunity to stay in such a beautiful old village. Our host, Katherine, was very prompt in communicating with us when we were booking the property, and we appreciated that she accepted a shorter booking than usual as we arrived late in the season. Ines, the local who oversees the property, was very friendly and welcoming. The house itself was very comfortable for all of us. The kitchen is small but functional and the living/dining and bedroom areas are a good size. The outdoor courtyard is delightful and great for al fresco dining. The distance from the car park to the property was shorter than I expected from previous reviews, and was not an issue for us. We enjoyed returning to this picturesque, quiet environment every day after our travels. Many thanks to both Katherine and Ines for this unique experience. We also highly recommend spending a day kayaking on the Dordogne - this was a highlight for our family. Charming Cottage in an Authentic Setting .. Delightful! Our time getting to Berbiguieres, including finding it and unlocking the door! !, was an adventure, but once there we were mesmerized with the authenticity of the setting. We felt like we were time-capsuled back to a time of simpler, purer life pleasures. The cottage was well appointed for all basic needs .. the biggest challenge was with the stairs but otherwise, we found it to offer a special, secret, home-away from home. Ines, who oversees the rentals on site, is a warm, very welcoming person who too knows a lot of the history of this very unique village - she was a wonderful source of information and also a very kind host. Great base from which to explore the Dordogne. We absolutely loved the opportunity to partake of this special village and would return in a heartbeat. Rentals are Saturday to Saturday unless special provisions are made with owner.